For 150 years, Millvale has sat opposite of Lawrenceville on the Allegheny River, sharing in many of the economic successes of the region. When most of industry left Pittsburgh with a trail of economic and environmental distress, Millvale shared in that as well. One of those environmental distresses is the shared impact of regional air pollution. 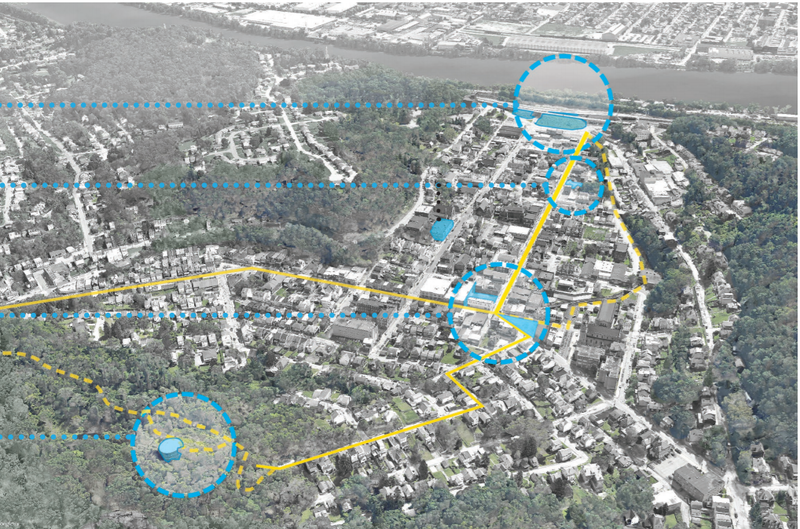 Since the floods of 2004 and 2007, Millvale has emerged as a leader in neighborhood scale sustainability planning and development, with grassroots, resident driven efforts to reverse course. Starting in 2012, Millvale adopted the EcoDistrict planning process which helps steer Millvale’s sustainable economic development through the lens of sustainability, with programming in the areas of food, water, energy, mobility, equity, and air quality. Air quality was chosen as a planning area because research shows that the Pittsburgh region, while better than it once was, still carries some of the worst air quality in the country, with Allegheny County being in the top 2% for cancers caused by air pollution. 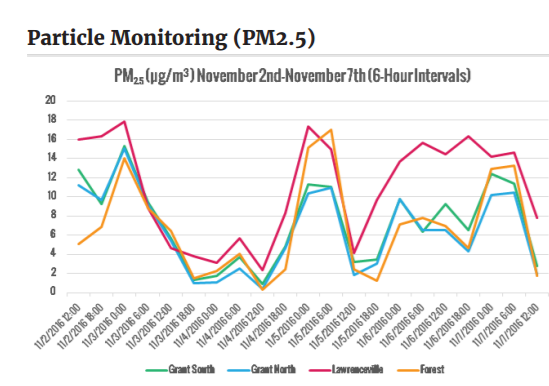 While we knew air quality was likely a problem, we had no idea what type of impacts our community was experiencing and what community members could do about it. This is when we started to get involved with ROCIS (Reducing Outdoor Contaminants in Indoor Spaces) in earnest with the Millvale Community Library. We quickly started to confirm what ROCIS cohorts were already observing elsewhere; the air quality is usually worse outside than it is inside, and that our indoor air quality fluctuated, trending closely with outdoor air quality. While that news was certainly eye opening, it wasn’t all bad news. Through radon monitoring we determined that while our basement can read higher numbers in the winter, the library space remained better than both the World Health Organization and Environmental Protection Agency standards. Armed with this information, we were motivated to learn more. Through a partnership with The Heinz Endowments, we were able to conduct a community-wide monitoring initiative. 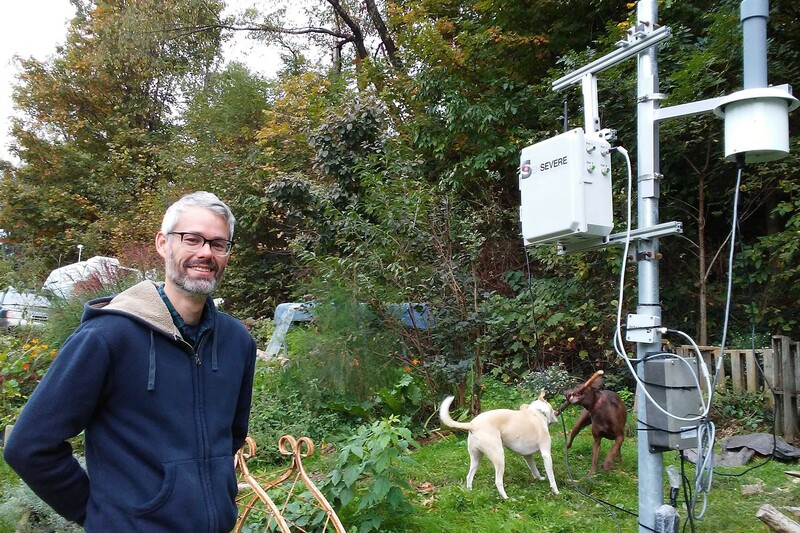 Partnering with ROCIS, CMU, Pitt, the Group Against Smog & Pollution, Women for a Healthy Environment and others, we installed monitoring equipment on municipal light poles, as well as the backyards of residents who volunteered to measure multiple criteria air pollutants. What we learned wasn’t shocking, but it was very informative. We discovered just how closely tied our air quality is to the region’s. This information is extremely valuable to us on the community planning level, because it shows us what we need to be worried about, and when we need to be worried about it. With air quality being a regional problem, it gives our community information to become stronger advocates for Millvale and the region as a whole. We often get caught in a debate between the economy and the environment. What community scale monitoring is continuing to show is the fact that the two are closely tied together. Think about how industrial scale air pollution results from revenue generating activity but also has associated costs that are not accounted for. For example, what is the societal cost of treating high rates of respiratory illnesses in children and other vulnerable populations? What is the cost of decreased worker productivity from parents who have to miss work to take their children to the doctor? What is the opportunity cost for children who don’t reach the economic heights possible because they were missing school? These are questions we can ask because we can now see that industrial scale polluters who might be far from Millvale, still impact Millvale. This kind of information is particularly important now as the new Beaver County Ethane Cracker Plant could double the region’s carbon footprint, while also doubling the amount of volatile organic compounds in our air. With the facility being upwind from the Pittsburgh area, our community members might be put under health stressors greater than what already exists. Millvale already has twice the cancer rate of Allegheny County. In addition, having this information can help us start the conversation of how to better adjust our behaviors to reduce negative impacts. 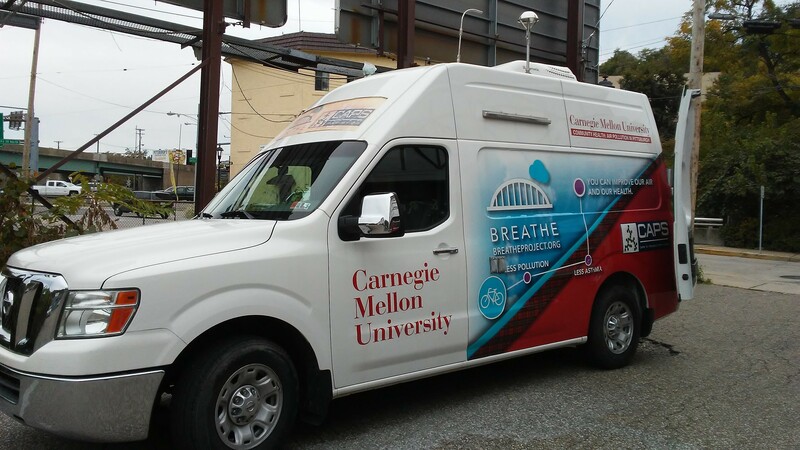 In Millvale, we are now working to develop an air quality dashboard that will display live air quality data while giving people tips on what to do to reduce impacts. This could mean not going for that run or bike ride, or keeping your windows closed if possible on high pollution days. We are also creating public infrastructure projects that can help people visually connect to air quality in fun and artistic ways. Since starting our ROCIS adventures, we have also added educational programming, acquired particle and radon sensors to loan to Library cardholders, and improved the functionality of the Library’s air filtration system. Air quality can seem like a big, complicated issue, because it really is. What ROCIS has helped us do is make sense of it all in a way that is relatable to our community. With summer programming kicking off, we are working to involve more youth in our monitoring to start creating leadership for our next generation. With knowledge, we can start reducing the pain points people have to live through in smart, accessible ways.